Set your TrijiDot sights on target! 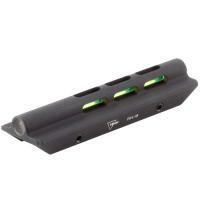 Trijicon TrijiDot Fiber Optic is designed for shotguns to give you a bright target in all lighting conditions. The Trijicon fiber optics sight works by collecting ambient light to provide a brilliant aiming point thereby giving you faster target acquisition. This Trijicon sight contains a sapphire jewel to help with light distribution. The housing unit is made of anodized 6061-T6 aluminum and stainless steel, providing a rugged durable sight that is able to withstand shotgun recoil and hot barrels with many years of use.